Clemson Girl: Stock up on gameday looks with blake & brady boutique...tax free! Stock up on gameday looks with blake & brady boutique...tax free! 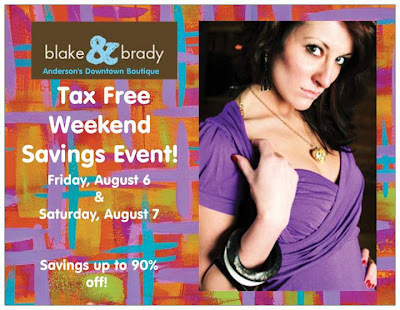 Tax free weekend in South Carolina is definitely an incentive to get off the couch this weekend and do a little shopping - but 20% off of the gorgeous clothes and jewelry at blake & brady boutique, plus 50 to 90% off of clearance items (yes, 90%! ), is reason enough to treat yourself to some retail therapy this weekend. Now is the time to find your perfect gameday outfit for the first game, and blake & brady boutique in Anderson has an amazing selection of purple and orange. And everything they have is unique - so you'll stand out in the crowd...like this dress for instance, it's so unexpected, but I love it. You can take advantage of this sale by visiting blake & brady in store at their Anderson location Friday, August 6 (10am - 7pm) and Saturday, August 7 (10am - 5pm). Don't live in the upstate? No worries! You can shop blake & brady's looks via their Web site or their Facebook page - and order by phone (864-965-9120). They can ship anywhere with a flat shipping rate and offer free shipping for orders over $100! I'm in love with this dress - it's so different (in a good way!) and I think it would look lovely paired with the orange necklace - perfect for gameday! But I also like how versatile the necklace is - because you could wear a plain white t-shirt and the necklace totally dresses it up. And if you're a gameday dress girl like me, blake & brady have you covered...I'm really digging the orange sleeveless dress with the zipper and ruffle detail. It looks really comfortable, which is key for gameday outfit selection. But if you're more of a shorts or jeans gameday girl, no worries, you will still look amazing by pairing them with one of these lovely tops! Don't miss out on blake & brady's amazing sale (plus no taxes) this weekend. September 4th is only a matter of weeks away ladies - time to find that perfect gameday outfit! What are you waiting for? Just found your blog, and glad I did. LOVE the orange dress!